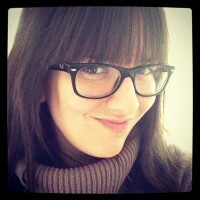 Meet Heather, the crafty zinestress behind CROQ. For the past wee bit, Heather and her team of crafty writers have been working hard to bring DIY news to the masses with their zine. Take a look at what she has to say on the ins and outs of self publishing. What’s your name, how old are you and where are you? Heather Mann, 30, and I’m in Portland, Oregon. What’s the name of your zine? How long has it been up? 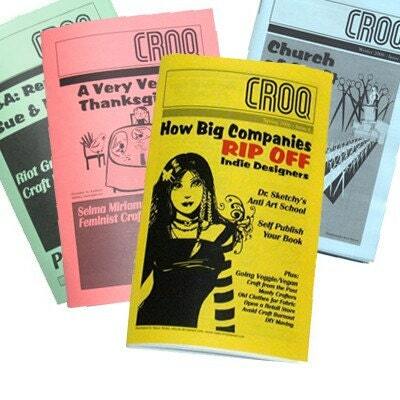 CROQ Zine, and we’ve been publishing since Spring 2005. Dayna “Crafty Scientist” Mankowski posted a note on the Sampler Livejournal community that some of us crafters should put together a zine about crafts. About 10 of us answered the call, and a few months later, CROQ was launched. What are some of the challenges that come with running your own zine? The easy part is collecting stories and putting it together. The hard part is stapling all those zines, shipping them out, and keeping on top of customer service. The impossible part is keeping good records! What do you enjoy most about your zine? I love it when a zine comes together (ha ha, quote ripped from “The A-Team”). I love it when a new issue of the zine is all finished, and I get to put it up for sale. Something about a completed project is just fun. The Internet. I would probably be just a fraction as crafty if I didn’t have the Internet. If you don’t know how to do something, you can find it on the Internet. If you don’t have a special supply, you can buy it on the Internet. If you need inspiration, you can join a challenge on the Internet. If that’s a cheaty answer, then I would have to say a sewing machine. I hate hand sewing! I think it’s a backlash against the the glut of low-quality low-priced junk that has flooded our marketplace. We don’t value our possessions because there is no thought behind them. We just pay out our hard-earned cash for crap we don’t need, and then we feel overwhelmed with the volume of junk that is crammed in our homes, and we get rid of it. It’s an ugly cycle. When something is handmade, its value is increased because of the amount of time, effort, and love that had to go into producing it. Really, handmade is the way it has ALWAYS been until the last two centuries. We have tried a lot of different ways to promote ourselves: online advertising, The Sampler, sponsoring events, trading promos with other businesses, craft fairs, but I think our most successful promotions come from satisfied customers who share CROQ with friends, and keep coming back for more. Our big secret is that we try to be very consistent with our zine-publishing schedule. Because zines are independent, you can never count on a new issue coming out. With CROQ, I wanted to make sure people knew that the next issue would always come out as planned. It has gone a long way toward building confidence in our brand. What advice would you give to someone who’d like to start her own zine? Go for it! The hardest part is getting started. After you do your first issue, it gets easier. Sell it on Etsy, send copies to the Sampler, contact one of our crafty community’s awesome distros and see if they would be interested in carrying it.